Cat Socks Box are extraordinary socks for true cat lovers! Ears, tails and whiskers guaranteed! 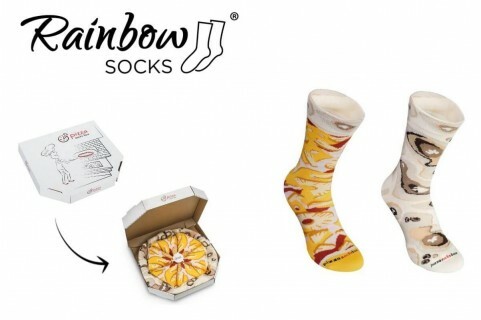 :D Created with passion, high-quality socks produced in EU. Cat Socks Box - See the way the sock jumps! Our unbounded love toward cats inspired us to create socks which look like cats. While opening box you’ll find carefully sewed catty eyes, a cute pink nose, long whiskers and smiling muzzle with sticking out little ears - hunting for you. Moreover, every pair of our cat socks has a tail created by using a pompon with a small bell attached to the sock by a loop. Now your furball will always know where his beloved owner is. The pompon is not only a decorative element but it may be also used to play with your cat. Because it doesn’t engage your hands you can work or relax reading your favourite book while waving your feet. Your pet won’t be bored for sure! It was during breakfast when our cat was changing into a devil doing everything he shouldn’t. That’s why we had to find the way to tame the animal and focus his attention on one thing. And this is how the idea of Cat Socks Box was invented. You just eat your morning cereals, wave your leg and cat plays with his new socksy friend. When the hunting is done and you go out, just detach the lace with pompon from the loop, put on your shoes and go wherever you want. 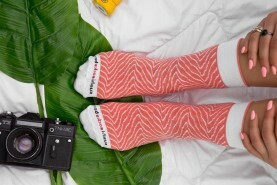 The softness of our socks will provide you comfort during the whole day. Cat Socks frotté are very warm and super comfy to wear in the house. Our socks are produced in EU from the high-quality materials. Mostly coming from India and Germany hand knitted combed cotton received the Oeko Tex certificate which is world - known indicator of security of textiles. Thanks to its heat-insulating attributes, cotton protects feet from cold and overheat. Make a gift for you and your cat! Catty three pairs of socks consist of white, grey and black frotté socks in 36-40 EU size. CAT SOCKS BOX is a sock that resembles a cat. Each sock has big eyes, pink nose, long whiskers, smiling face, and a tail, that is an attached pompom with a small bell. Here you can choose a one-pair option. CAT SOCKS BOX is a sock that resembles a cat. Each sock has big eyes, pink nose, long whiskers, smiling face, and a tail, that is an attached pompom with a small bell. Here socks are available in a 3-pair box.